If you want to mix things up in the studio you can try processes that deal with careful removal rather than careful application to create your image. This reversal can shake things up and help you to build awareness about your art in a different way wether it's technical aspects of an image or the overall message/mood of your images. One of the simplest ways try out the removal process is to cover a large area of paper with charcoal like in the image at the top of this post. 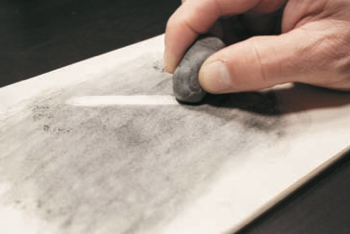 Then you can use a kneadable eraser and a few other types of erasers to remove the charcoal to creat your image. This is also a great exercise in working with tones and values. When you are forced to start with a dark tone and work your way to white your awareness of value and contrast gets refreshed. Another very simple way to get into this way of working is via collage. With your trusty exacto knife you can practice the art of removing elements from images to create interesting new compositions and narratives. Removing parts of images can completely change the feeling of the piece as you can see in the image below. 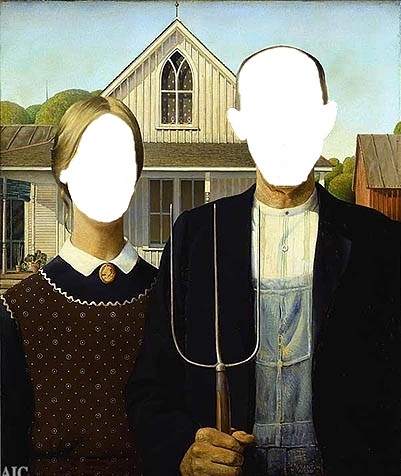 The famous painting "American Gothic" by Grant Wood is famous for the stern facial expressions on the figures which set a brooding tone. Below the image has been altered and the faces removed. Now it holds the mysterious calm of anonimity.